In India, almost 69% of the land is dryland. However, 40% of the total food grain production and over 60% of the livestock production comes from these regions. Given the climate projections (IPCC and other recent scientific literature), this area is highly prone to getting warmer and dryer ( heat waves, more hot days) with more erratic rainfall patterns. Manifestations of climate change-related phenomena is all about livelihoods of rural poor and difficulties of coping with it. Not only do they need to deal with non-climatic stressors such as market price fluctuations, fast reducing landholdings, depletion of natural resources among many others but also the added uncertainty that climate change brings. Literature in the recent past indicates crisis particularly rural households whose sole means of earning is agrarian. Among other regions drylands (arid and semi-arid regions) are comparatively more vulnerable as they are not only inherently bio-physically vulnerable but host the majority of the poor almost entirely depended on natural resources for their survival. Adapting to such climatic conditions is critical, as it will have a significant impact on rural livelihoods, through innovative strategies that are climate compatible to combat/minimize its impact and make communities resilient. In the above context, Watershed Organization Trust (WOTR) has been implementing several climate compatible agricultural interventions in a cluster of villages in Rangareddy Nagarkurnool and Mehabubnagar Districts of Telangana. While the overall aim is to stabilize incomes and minimize risks arising from unpredictable weather patterns through a basket of adaptive sustainable agricultural practices; the principles are embedded in the efficient use of natural resources particularly through a) better water management practices and b) soil health maintenance. These practices, help conserve local resources keeping ecosystems healthy thereby making the community resilient to climate change risks. Promoting these practices by civil society organisations and other agencies is not new. On the other hand, the success rate in adoption of such practices by communities seems to be limited.WOTR has been continuously working towards learning, identifying gaps and improvising on the strategies since 2009; while implementing one of the largest climate change adaptation projects in India. Narrated below is a story of an innovation champion Shri Ganesh Goud, who along with 5 farmers from his group have adopted a new approach called the Group Micro Irrigation (GMI) approach and is a change maker at the community level. WOTR has been promoting this approach since 2014, and 11 groups are covering 149 farmers. The experiences of convincing farmers about the advantages this approach has been a challenging task – as sharing water resources particularly in a drought-prone area where it is becoming scare every year is a contentious issue! However, like every cloud has a silver lining, the story of Ganesh Goud and his group from Badnapur village is one to share. What is this “GMI approach ” ? The GMI approach is an integrated approach to agricultural production that consists of four components namely a) groundwater management, b) climate compatible agriculture practices, c) collective marketing, and d) small methods/tools that support decision making for crop planning. The groundwater management component focusses on the collectivization of private groundwater resources through the establishment of a common drip irrigation system for a group of farmers to ensure efficient and sustainable use of groundwater. To manage the supply side, the construction of watershed measures is undertaken on farmers fields to harvest rainwater and aid in groundwater recharge. Climate compatible agriculture practices aim at boosting soil and plant resilience as well as promotes crop diversification. The third component of the approach facilitates market linkages for farmers to access better prices as well as incentivize farmers to adopt climate compatible agricultural practices. The fourth component integrates research in the form of small methods/tools methods such as crop water budgeting, borewell monitoring and checking pump discharge. This approach is necessarily implemented in a group where farmers households with adjoining farmlands come together to cultivate crops and use water resources judiciously. While the adoption of micro irrigation systems is an effective response to climate change, it has its limitations. The lack of water pressure could render the system non-functional thereby exposing farmers to a certain degree of vulnerability. The other components of this approach minimize the risk greatly and support small and marginal farmers to use drip system efficiently; which is the overall aim of the approach. In this context. Ganesh along with five other farmers came forward to adopt the GMI approach in August 2016 . This group was a mix of Ganesh’s siblings and 3 other farmers, having a total farmland of of 16.06 acres. In the beginning, the group was skeptical to pool 6 borewells. However, Ganesh’s inquisitiveness, the knowledge he gained through print and electronic media, and his networking abilities; helped him play a key role in quickly adopting this approach in their group. Ganesh quotes in a discussion “I knew about all these new approaches but had no knowledge where to get the instrument s, even if we did get them, no one was available to provide extension services on how to use this. WOTR has a played a key role in filling this gap”. Moreover, he was aware of the benefits of drip irrigation system and the subsidies from the government departments through his kinship group in Jangareddypalli village. Hence, he readily agreed to WOTR’s proposal for Group Micro Irrigation model. He states that, “after the installation of the drip irrigation by pooling of borewells there is a fourfold increase in irrigated cultivated area from a minimum of one acre per farmer to almost 16 acres for the group. “Additionally, the farmers in the group are able to take multiple crops and adoption of System of RIce Intensification (SCI ) method of crop production increased the yields. Use of locally prepared organic insecticides, growth promoters and fertilizers also reduced their costs significantly. Further, farmers are able to devote more time for livestock rearing as water supply to the standing crop is taken care of by simply turning a valve. This was an interesting insight and learning that smart use of technology does help manage resources efficiently and has the scope of reducing conflicts when it comes to resource sharing and management. What makes Ganesh the Innovation Champion? While interacting with him, he comes across as a simple person with clarity of articulation and enthusiasm to know more about new things. With his knowledge base, he has provided the information about the schemes to other farmers and provided the necessary contacts in the government departments. This ensured that other eligible farmers also got the benefits of the subsidy schemes. 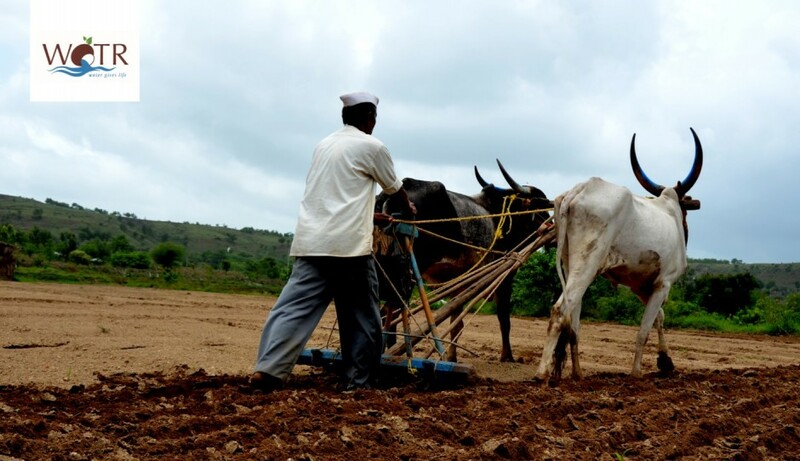 Being a farmer with small landholdings and a well-knit network, clarity in articulation and motivation gave him access to several positions in Badnapur village and Talakondapalle Gram Panchayat. While in this position, he facilitated the process of getting pump sets and sprinklers provided to five families in his village on 75 percent subsidy from Agriculture and Horticulture departments. During this period, he facilitated the process of accessing subsidy through which five families were able to get submersible pumps from the agriculture department. Also 8 sprinkler sets – 7 sets to farmers from the village and one set to farmer in another village – were provided on 75 percent subsidy from Horticulture department. Subsequently, he became Chairperson of the Watershed Committee in 2004 for which he was elected unanimously.In 2006, he was elected the president of the Vidya Committee to monitor the education activities in the school in the village. As the President of Netaji Youth Committee, he got financial assistance for constructing Yuvajana building from NABARD. He also facilitated the process of building a road to the Tanda by coordinating with the local MLA for releasing funds through JanmaBhoomi Program. In 2013, he was elected the member of the 12th Ward in Badnapur village and has been taking steps that would benefit the community. As the Ward Member, he ensured that the 150 meter cocrete ( CC) road was laid in the village through MGNREGS works. Though majority of the work was done using machinery, 8 – 10 person days of curing work was provided to 4 people in the village (at a wage rate of Rs 250/person/day). Altogether, as the member of several committees, he has always worked for the benefit of the community and has ensured that the villagers avail the benefit of the government schemes too. Ganesh’s network of social capital has given him the confidence to be part of this pilot initiative. What emerges clearly from this case is that Ganesh is an enterprising farmer who is willing to try out new initiatives due to the high risk-taking capability. Since the family’s resource endowment in terms of social capital, access to economic resources and political network is high, the risk-taking capability of the family relatively better off. As incumbent in several official positions across time, he built social capital in terms of political networks and social contacts with officials and administrators alike. His motivation and initiative for the larger good instilled confidence among the community members about his capabilities. In addition, he and his family members maintain continuous rapport with the villagers which further enhanced the community perception about the family. Besides being repository of the scheme based information, Ganesh also presents an interesting case for creating ripple effect on the GMI approach and its benefits not only in Badnapur but also in the surrounding villages. He proactively shares the benefits by practically showing all the techniques as visitors come regularly to his farm. The visitors range from government departments, NGOs, other farmers living nearby and the local press. He facilitates interaction between the eligible/needy farmers and the government officers from Badnapur and neighboring villages using his groups experience and what he has learnt from WOTR as well. He is well networked with the officials of the local line departments with whom he shares cordial relations which adds an advantage. Lastly, farmers like Ganesh Goud are striking examples of the importance of active community participation in adopting technological advances.